Hail storms hit Lexington, KY August 1, 2017. Make sure your roof is repaired properly by following these important steps. Today hail storms struck homes near Leestown Rd. and Meadowthorpe Park in Lexington, KY. If you’re home was in the path of this storm, your roof may have been impacted. Here are some helpful steps and advice to consider following. Many homeowner we work with at one time or another have taken a look around their house to see if their roof appeared to be in decent shape. If any saying rings more true, it would have to be…”looks can be deceiving“. Storms, specifically hail and wind, can impact a home in such a way, that in most cases, the average untrained homeowner can not tell whether they have any type of damage or not. Now, if you happen to notice large gaping holes in your roof, well, it may be obvious. However, more times than not, hail doesn’t initially provide any real visual notification from the ground level. It takes a trained eye, which our team happens to be specifically certified for. 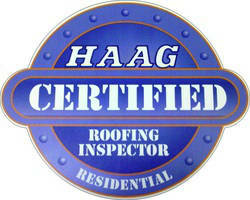 Lexington Blue employs HAAG Certified roofing inspectors. With HAAG Certified training, it has given us the expertise to be able to identify the difference between normal wear and tear and real identifiable storm damage. It means we have the knowledge and skill to not only identify damage, but also to be able to prove such damages should your insurance carrier require it. Call or Request Your Free Inspection! This second step isn’t something you’ll have to worry about if you request our services for a free roof inspection. As we inspect your roof, we make sure to keep a thorough record that includes all documentation and evidence we discover. This includes pictures, videos, measurements, etc. By ensuring that you have all of your home’s damage well documented, you’re placing your home’s future repairs in your best interest. Assuming you file a claim to repair your roof, we keep all necessary documentation on hand to ensure you get all the repairs that you’re entitled to. Assuming that you’ve had your roof inspected and everything is well documented, the next step would be to file an insurance claim. NOTE: Many homeowners can often assume the worse when it comes to filing an insurance claim. Schedule a free appointment with one of our inspectors to discover how most of the myths associated with claims are far from the truth. One of the many benefits our clients are satisfied with is our ability to work directly with them and their insurance company. This makes the process not only go smoothly, but also ensures that you get all repairs that your home is entitled to receive. When you factor in all the steps necessary to repair storm damage on your home, the roofer should be weighed in heavily in terms of consideration. 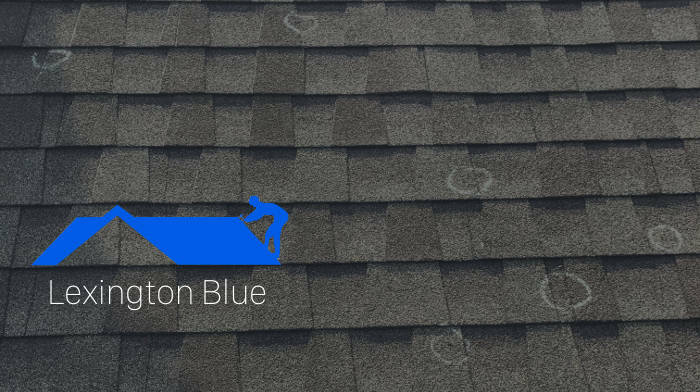 At Lexington Blue, we don’t just specialize in hail storm roof repair, we also specialize in quality services that are guaranteed to ensure satisfaction. We’re proud to be one of the top rated roofing contractors in Lexington, KY. Our years of servicing clients with quality assurance has and always will continue to be our number one priority. We understand you’ll want the best service provider in your corner. Here are a few helpful resources that hopefully prove our promised commitment to you should you choose to select us as your roofer of choice. To determine if your roof has been impacted by the hail storm in Lexington, contact us for a free estimate.